The Fox Hills Sandstone has a regionally extensive top seal known as the Upper Hell Creek Confining Layer. The thickness of this top seal is well documented across the entire Powder River Basin (Lewis and Hotchkiss, 1981). 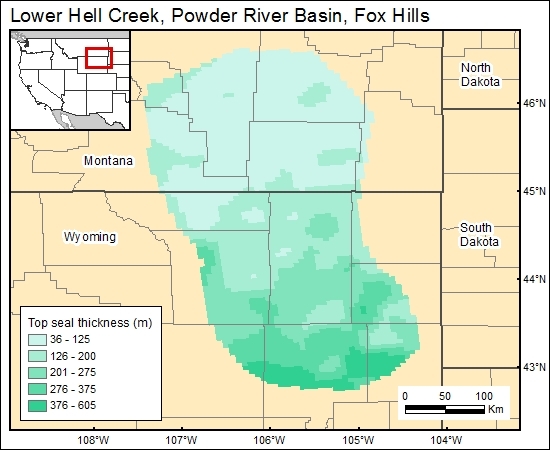 The thickness of the top seal increases from approximately 200 ft (61 m) in Montana to more than 1,000 ft (>304.9 m) in the south part of the basin, where distal-shoreface and shelf Fox Hills Sandstones intertongue and are overlain by marine mudstones in the Lewis Shale. Lewis, B. D., and Hotchkiss, W. R., 1981, Thickness, percent sand, and configuration of shallow hydrogeologic units in the Powder River Basin, Montana and Wyoming: U. S. Geological Survey, Miscellaneous Investigations Series, Map I-1317, 6 sheets.